May 22, 2008. News: And grandma & grandpa. Is coming in may 22, 2008. 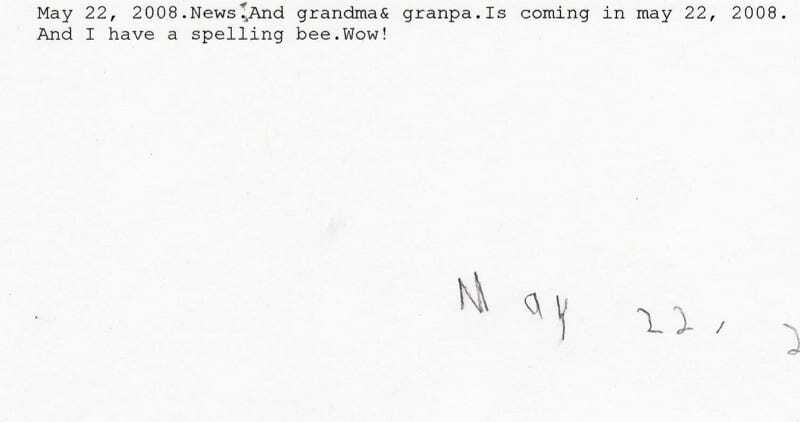 And I have a spelling bee. Wow! She spelled all 100 of the spelling words correctly and received a great medal she is so proud of that she wore it 2 days in a row. Lillian’s grandparents from Washington are visiting next weekend and she is very excited. When she was very young we had to determine a way to differentiate between the grandparents. So, Joyce and Phil became known as fishing grandma and grandpa with the sign language for fish thrown in front of grandma and grandpa. 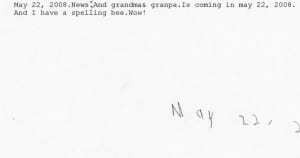 Otherwise; we didn’t know which grandparents she was talking about!